The destruction of Sodom and Gomorrah is a vividly recorded event in the early chapters of Genesis. Estimated to have occurred about 4050 years ago (~2050 BC), the Biblical story provides us with a picture of the specific moment of the destruction of these cities, as well as the still-observable Dead Sea region. Interestingly, the Dead Sea has experienced many earthquakes. What can we learn about those earthquakes by studying the geology of the Dead Sea sediments? Will they tell us what might have happened to Sodom and Gomorrah? We have established that the Dead Sea is formed by tectonic activity, including two plates sliding past each other and pulling apart at the same time. Like other such faults across the Earth, these tectonic movements are the origins of most earthquakes. The Middle East has been prone to earthquakes, and the long written history of the region makes it a great place to study earthquakes and their effects. The chronology of layered sediments in the Dead Sea region provide us with a fantastic record of past earthquakes. This in turn allows us to compare those earthquakes with ancient historical records, such as those from the Bible. A Creationist Article Has It Right! Recently, geologists have investigated the 4,000-year chronology of earthquake disturbances within the uppermost 19 feet of laminated sediment of the Dead Sea. Hypersaline waters preserve seasonally laminated sediment because organisms cannot live or burrow in the bed of the lake. As a result, only a nearby earthquake (or very large distant earthquake) can homogenize the lake’s uppermost sediment layers, producing a “mixed layer” devoid of laminations. A sketch of a sediment core from the west side of the Dead Sea appears in Figure 1. 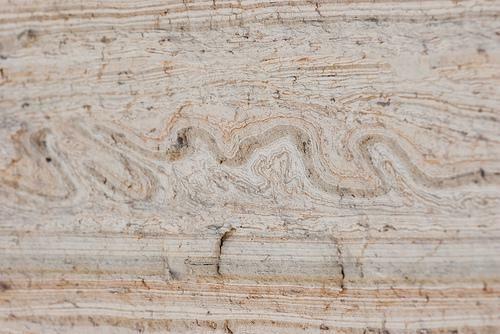 The sketch shows the depth of the “mixed layers” within the laminated sediment sequence. Two deeper mixed layers in the Dead Sea are datable from historical, archaeological, and geological associations with faulting—the earthquakes of 31 B.C. (the Qumran earthquake) and 750 B.C. (Amos’ earthquake). Other earthquakes are represented in the Dead Sea sediment core with dates approximated by assuming a steady rate of sedimentation. …. Two Early Bronze Age archaeological sites southeast of the Dead Sea (Bab edh-Dhra and Numeira) reveal evidence of catastrophic collapse and burning along the eastern border fault of the Dead Sea Transform Fault. These two sites are likely the remains of Sodom and Gomorrah.7 A thick disturbed zone within the Dead Sea sediment core, assignable to the Sodom and Gomorrah event, occurs at a depth of about 18.5 feet. Fig. 3. Figure 1 from Austin’s paper on earthquakes and the Bible. This is cartoon version of a profile of Dead Sea sediments showing the position of seismites indicating the action of an earthquake. The dates come from C14 and inferred rates of sedimentation. To Austin’s description I would add that the 19 foot sediment profile was obtained from the wall of a canyon that was carved in the past decade due to the Dead Sea’s rapid evaporative lowering. The “mixed layers” Austin refers to have a technical name: seismites. The thickness of the seismite can be used to infer the magnitude of the earthquake. There are similar earthquake signatures found in ocean-floor sediments. The 2050 BC seismite (fig. 3) might be associated with the destruction of Sodom mentioned in Genesis 19. If that is the case, then this sediment core tells us that the Dead Sea must have covered the area where these sediments were observed at the time of the earthquake, since the seismites would not have formed if the lake had been at a level it is today or lower. In addition, the original research papers (refs 2 and 3) were able to identify almost every major written record of earthquakes in these layers of sediment. Thus, the Dead Sea had to have been above its current levels during the time of these earthquakes. This is additional evidence that the Dead Sea is lower today than any time in recorded history. Let’s look back at the article by Brian Thomas from ICR (see Part V: All Dried Up). Thomas claims that the pebble layer, which is nearly 1000 feet lower than this seismite, represents the time of Sodom. And yet if Austin and other geologists are correct that the 2050 BC earthquake is recorded in this sediment profile, then Thomas’ claim must be incorrect. Confirmation of the recorded biblical events – Yes! Confirmation of a young earth – No! This 4000 year old series of sediments provides a wonderful confirmation of major earthquake events in the Bible, just as Austin claims. This work has been backed up by several independent researchers (see references). This research seems to provide nothing but good news for young-earth creationists. Until you dig just a bit deeper. The lower we go, the more troubling the data becomes (for YECs). It’s not that modern geology undermines the Bible at all. Rather, it offers a massive challenge to the YEC’s flood-geology interpretation of the global flood 4350 years ago. Fortunately, for Christians, flood geology is not an inspired fact of the Bible, but rather an inference derived by certain (flawed) readings of the Bible. The Dead Sea data, including the earthquake data presented in this post, should be cause for young-earth creationists to reassess their inference. If you have followed this series, you can probably name several observations of the Dead Sea that greatly trouble YEC flood geology, but let me just point out the most obvious one. The 4000-year old chronology of everything from Genesis 12 to the present day is contained in just nineteen feet of sediments! If sediments nineteen feet below the surface represent 4000 year old events, what does the young earth advocate do with the remaining 15,000+ feet of sediments found below them? Relegate them to a global flood obviously, but not for any reason other than it is the only choice they have to maintain the young earth paradigm. More specifically, Austin doesn’t mention that the authors of the works that he references had previously examined a sedimentary column that represented the past 50,000 years. Those scientists also looked at earthquakes over that longer time frame. What should Austin, or any young earth creationist for that matter, do with evidence that earthquakes occurred another 20 feet below the earthquake that Austin is claiming occurred in 2050 BC? Remember: the evidence that the Dead Sea dried out in the past (Part IV: All Dried Up) was found at least another 700 feet below this small nineteen foot sediment core. These sedimentary layers include thousands of layers of precipitated salts, which are surely the result of past precipitates from a salt-laden lake that had resided in this valley for hundreds of thousands of years. There is nothing about the sediments below Austin’s nineteen feet of sediment that would suggest that they were laid down under conditions any different from those that are experienced in the Dead Sea region over the past 4000 years. Where is the evidence for a global flood here? At the link above you can see a great image of seismites from other deposits in the Dead Sea Valley. At least two earthquake seismites can be seen here in set of sediments that were deposited far above the Dead Sea. These are Lake Lisan deposits and thus represent sediment deposited probably much more than 40,000 years ago. We can see that earthquakes have occurred and produced the same type of evidence in the rocks that we see happening today. Austin and other creationists need to account for the evidence of earthquakes in deposits that they claim were formed over very very short periods of time under what they believe were very different conditions. A “steady rate of sedimentation” is an interesting phrase, since it is a uniformitarian assumption, the kind of assumption that YECs regularly attack . Here we see that Austin is accepting the use of a geological principle that is so often maligned in the creationist literature. Of course, he doesn’t call attention to the fact that here he is accepting the principle of uniformitarianism , and yet there it is. The same is true for C14 dating, which is another thing that YECs often attack. Austin doesn’t tell his readers that the dates for some of the seismites were determined by C14 dating of organic materials found in the seismite layers. With dates attached to some of the seismites, the rest of the seismite ages could be estimated using a steady state (ie. uniformitarianism) assumption about sedimentation rates. Austin seems to accept this with no problem. This is the equivalent to using index fossils to date layers of rock. Again, it’s a principle that is routinely attacked by creationists. What we have here is a case where Austin is accepting the techniques and assumptions of the secular researcher community because the results they provide suit his purposes. The C14 data and the steady state assumption lead to predicted earthquake dates that fit the Biblical record of earthquakes very well. So it is understandable that Austin would be attracted to this particular data set. To question those assumptions would be to remove a good source of extrabiblical evidence for the events recorded in the Bible. But what about earthquakes in the sediment record that are below the 2050 BC earthquake? Is Austin, or any other young-earth creationist, going to accept the C14 dates and steady state assumption of deposition that estimates those earthquakes to have occurred at 5000 BC or 10,000 BC? No, in true fideistic fashion, they won’t accept those dates, for no other reason than they can’t be true. C14 dating and relatively uniform deposition rates are accepted for the past 4000 years but even in the face of similar evidence of a much longer timeline that evidence is discounted and said to be the result of processes that acted very differently than we observe today. I believe it is very likely that these disturbed layers represent the very earthquakes that both Austin and the original researchers have assigned to them. These dates corroborate the biblical record of those earthquakes (i.e., Sodom and Gomorrah). But I wonder if Austin ever has ever contemplated the consequences of accepting this interpretation of the data? At the same time that it supports the biblical timeline, it contradicts the young-earth view that the Dead Sea is less than 4350 years old. This is the conundrum that creation scientists get themselves into when they examine the geology of the Promised Land. They want and need to accept conventional geological interpretations and methods because those methods yield results that match the last 4000 years of recorded history, as found in the Bible. But the same methods applied to the whole record of this region yield no evidence of a global flood, but rather a long history of development of the geological features of the Promised Land. Flood geology does not offer an explanatory program, but rather creates a horror show of contradictory conclusions when it is applied to real data. Both Brian Thomas and Steve Austin want to accept some findings of modern geology because they can see that the data lend support to the Bible. But in accepting this research, they create hundreds of scientific and observational problems for their young-earth hypothesis. Often, this is why many creationists find it more convenient to simply dismiss new findings and try to explain them away rather than embrace them. For Brian Thomas, had he simply dismissed this dried- up Dead Sea idea as being a wishful misinterpretation of the data, he could be accused only of simply not confronting the data. But by trying to use the data and assumptions of contemporary geologists, to support his beliefs he revealed his ignorance of the geology of the area. And he created more problems than he was trying to solve. Austin’s article is right to show that the biblical record is supported by geological evidence. But he misleads his audience when he chooses to ignore data that undermine his young-earth hypothesis of Earth’s history. Addendum: What about the fire and brimstone that rained down on Sodom and Gomorrah as recorded in Genesis? 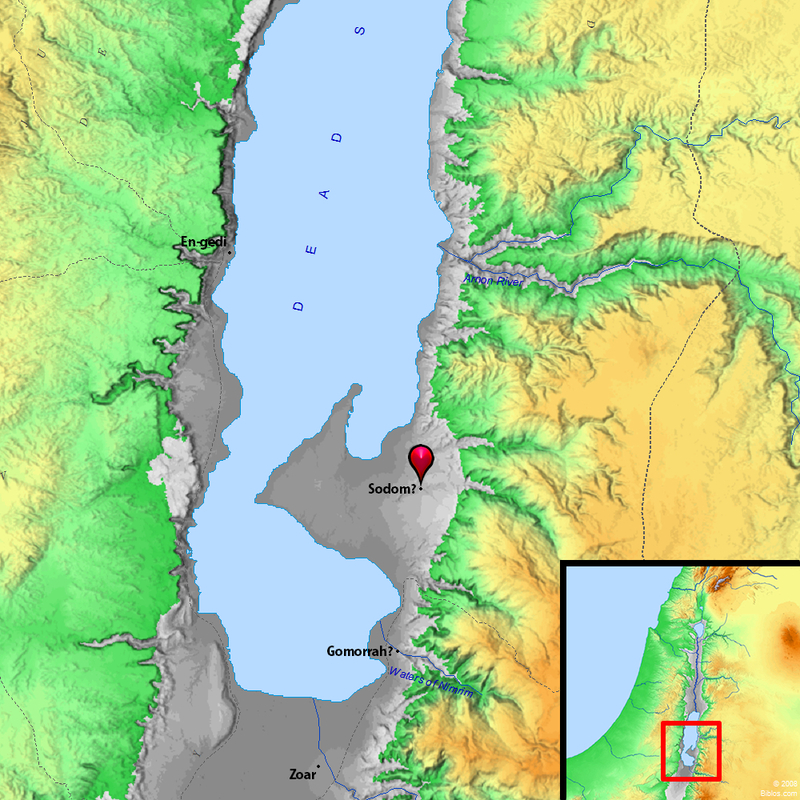 In my earlier description of the Dead Sea basin I didn’t mention another very important feature of the Dead Sea plain especially around the southern end of the lake. There are many bitumen deposits there and regions of high sulfur (brimstone). Bitumen is like asphalt and is a form of oil. It was highly prized in the Ancient Near East and the Egyptians were known to collect and mine it in the region. Today asphalt seeps into the lake and floats to the surface of the Dead Sea. There were pits dug around the Dead Sea in ancient times and a thriving industry of bitumen collection existed probably supporting the many ancient cities found in the region such as Zoar south of the Dead Sea. The bitumen is concentrated along fault lines because this is where the earth is cracked vertically allowing the oil to move up toward the surface. So if there is a large earthquake, the energy of the movement will occur within these deposits. It is plausible then, that a large earthquake could have disturbed a large vein igniting the oily residues creating a thick black smoke that would have filled the valley. In Genesis there is reference to “pits” that those fleeing the cities in battle fell into. It seems likely to me that these are the pits that result from sinkholes caused by salt caves but it could be this is reference to the many pits dug for bitumen production. At the same time the earthquake itself may have been caused by volcanic activity. Because the earth’s plates are moving apart the crack that has formed has a very thin crust compared to the plates and so lava from the Earth’s mantle more easily can puncture up through that crust and appear on the surface. Near the Sea of Galilee there are thick layers of volcanic rock from ancient eruptions that poured lava into the Dead Sea valley. South of the Dead Sea there are some small volcanic vents. Most of these are thought to have been active much earlier than 4000 BC but some activity is possible and the presence of lava near the surface, even if it doesn’t appear above the surface, would introduce sulfur compounds into the ground water and bitumen deposits. When the bitumen caught fire and exploded there would have been a distinct sulfur smell even without a volcanic eruption at the same time. 1 Austin, S. 2010. Greatest Earthquakes of the Bible. Acts & Facts. 39 (10): 12-15. 3. R. Ken-Tor et al. 2001. High-resolution Geological Record of Historic Earthquakes in the Dead Sea Basin. Journal of Geophysical Research. 96:2221-2234. 4. Marco, S., and A. Agnon. 1995. Prehistoric earthquake deformations near Masada, Dead Sea Graben. Geology 23(8): 695-698. 5. Marco, S., M. Stein, A. Agnonn, and H. Ron. 1996. Long-term earthquake clustering: A 50,000-year paleoseismic record in the Dead Sea Graben. Journal Geophysical Research. 101: 6179-6191. Thanks, I hadn’t seen that video. Great stuff. Thanks of those links. I’m surprised I hadn’t come across Austin’s presentation before. I don’t know how he could say there weren’t any sediments below. One article he references clearly referenced more and the other you can infer it from. He just wanted to avoid the implications of what the other sediment might mean. I wish I had been there to here him speak. I had planned to attend (mostly to hear Todd Wood talk about mtDNA) but didn’t get back from my Utah trip until the day it began and I just couldn’t make it. To clarify, Austin was asked if he saw any evidence of the flood in the layers that went deeper than the ones he was looking at for earthquakes, and he said there wasn’t any evidence. But the implications weren’t dwelt upon. mantle to keep the earth at a near constant temperature. The Old earth was much different from the young earth after the flood, The data has to have a step function with a sudden change and the count begins all over again after the deluge.